Picture by Alex Whitehead/SWpix.com - 08/04/2015 - Cricket - Yorkshire CCC v Leeds/Bradford MCCU - Day 2 - Headingley Stadium, Leeds, England - Yorkshire's Jack Brooks (centre) is congratulated on the wicket of Leeds/Bradford's Logan Weston. Jason Gillespie hailed Yorkshire’s opening victory over Worcestershire as one of the best since he arrived at the White Rose county. 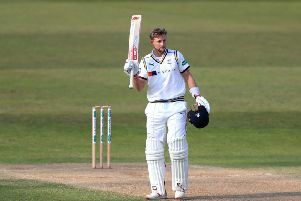 The defending County Champions blew Worcestershire away inside three days despite the loss of six players to England, captain Andrew Gale to suspension and Wetherby’s Ryan Sidebottom to injury. Without Joe Root, Gary Ballance, Liam Plunkett, Adam Lyth, Adil Rashid and Jonny Bairstow (all with England), Steve Patterson’s career best 5-11 and Jack Brooks’ nine wickets across the two innings steered Yorkshire to a 10-wicket win. Worcestershire had eeked out a four-run lead in the first innings before Yorkshire rolled Worcestershire over for 100 in the second innings. Alex Lees (52no) and debutant Will Rhodes (45no) then strolled to the target without any trouble on Tuesday. Gillespie, the Yorkshire first-team coach, described it as “one of the best wins I’ve been involved in” as his side – although heavily depleted – put down an immediate marker. “They took all our players away, banned our captain, and we still came away with a 10-wicket win, so we’re very pleased,” said Gillespie. “Some might argue that it was an easy win, but it wasn’t. They’re a good side, Worcester. They scored more runs than us in the first innings, and they’ve got some good players. “It was very hard-fought. We had to fight like hell in this game and the scoreboard is probably not a true reflection of how hard we’ve had to work. Sessay spin bowler Karl Carver was given an opportunity to showcase his skills with Rashid absent, but the left-armer failed to get a wicket in six overs of the first innings. Studley Royal’s Ben Coad travelled alongside the squad as 12th man. Sidebottom pulled up in with a calf injury and is expected to be out for at least two weeks. Meanwhile, Gillespie has been officially confirmed as coach of Adelaide Strikers. Gillespie will coach the Australian Big Bash franchise in a job that runs alongside his Yorkshire role.